The long-awaited release of the first documentary feature ever on African American language varieties and the powerful role of language in African American culture. An amazing and thought-provoking film. Absolutely fabulous. … thoroughly educational, engaging and inspirational. An awesome film. … This video belongs in an international museum for the world to see. The creativity and resilience of people living through oppression, segregation and the fight for equality, and the powerful identity forged by a shared heritage are all expressed in the ways African Americans communicate. 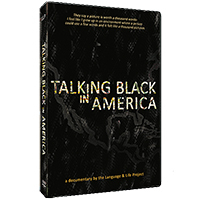 TALKING BLACK in AMERICA chronicles the incredible impact of African American English on American language and culture. Filmed across the United States, this documentary is a revelation of language as legacy, identity and triumph over adversity. The status of African American speech has been controversial for more than a half-century now, suffering from persistent public misunderstanding, linguistic profiling, and language-based discrimination. We wanted to address that and, on a fundamental level, make clear that understanding African American speech is absolutely critical to understanding the way we talk today.